The Kontrol Kube Advanced containment unit incorporates all the elements of the original TopSider enclosure and adds new features that make it even easier to create temporary containment. Durability, flexibility and functionality have been increased to make this the most advanced containment enclosure available – more than three times stronger than traditional vinyl enclosures. Synthetic Fabric Enclosure: Over three times stronger than traditional vinyl enclosures. This advanced fabric meets NFPA 701 and California Fire Marshal fire rating. Detachable Flanges: Anteroom and MultiUnit for larger containment. Anteroom flanges connect the unit to a doorway enabling room containment. Connector flanges allow multiple units to be connected together. 12” Negative Air Port: Ensures compatibility with all popular negative air machines, including the Kontrol Kube Negative Air Machine. 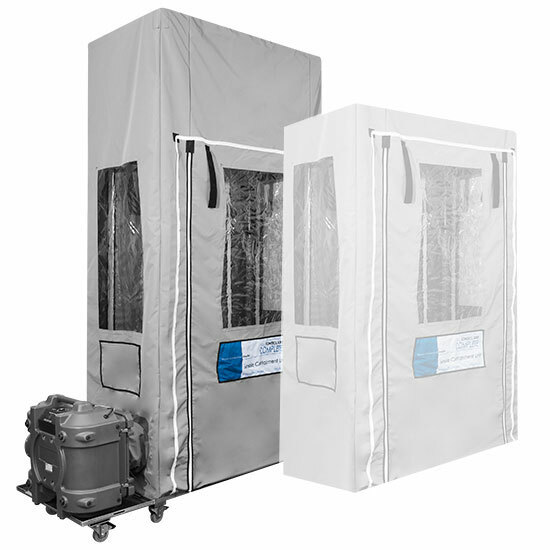 8’ and 10’ Enclosures: Meets your facilities specific needs. Both units are adjustable down to a working height of 7’. Webbing Reinforcements: In high stress points and wear areas ensure long life. “Sag” Restraints: Prevent the enclosure from sagging when lowered. The enclosure folds on itself like an accordion, maintaining a tight profile at any height. Bolt Action Poles: Make it simple to adjust the height of the unit and increase the overall strength and rigidity of the Uniframe. Sky Dome Ceiling: Clear interior ceiling flaps allows for easy placement of unit for overhead ceiling work. Collapsible Design: Allows the unit to be stored easily and take up less space. New features allow a unit that is collapsed to be set up in less than 2 minutes.